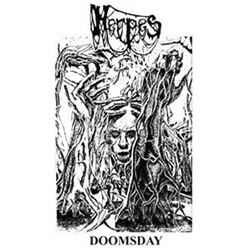 Welcome to the universe of the French HERPES – death, doom and destruction are what this is all about! This is their first demo, released on tape by Carbonized Cells and on CDr by the magnificent underground label Nihilistic Holocaust – if you wanna get a scent of what’s going on in horrific darkness, jump their way! When the CD starts spinning, downtuned and dirty raw madness emerges from the speakers and the listener is intertwined in a doomy gloomy dark world of a gasping growl, raw guitar riffs, a rumbling bass and noisy drums, hidden just below the wall of guitar distortion and a heavy bass a little bit of control, in the controlled way. If you already haven’t thought AUTOPSY, this is the time – homage to the gods – without being a sad copy – this is wellmade and played Death Metal with intensity, darkness and passion! I dig the 5 tracks on this demo and this is yet a band I will be looking forward to hearing more from! They have a nice take on doomy and dirty brutal Death Metal and the keys utilized on the last track ‘Frozen Funeral’ is working quite well, more of that please.